12/30/11 – Here’s a little hint…I don’t care! I think all of us can be guilty of worrying too much about what other people think. But, remember, no matter what you do or what you say there will always be someone that disagrees, you can’t please everyone. And while you are wasting your time trying to please others, you are moving further away from being yourself. The you that makes you so original! The you that the world grows to know and love. So, who cares, why does it matter what others think about us? They don’t have to live our lives we don’t have to live theirs. So be yourself and be proud of it. You have one life to live so you should live it how you want, as eccentric as you need to to feel complete! This is something I was VERY guilty of in high school. You couldn’t pay me to go back to those days. I look back, and I think, really?!? Why did I care what people thought. I was so young and hadn’t even begun to truly understanding who I really was and what I wanted to accomplish. Since college I have made a huge effort to be me and not worry so much about what other people think, only worry about making myself happy and content (although I know this is hard and I am still guilty). Honestly, the people you think judge you and worry about you, probably don’t at all. So why waste your thoughts thinking about them when they could truly care less about you. Harsh but true, and a little relieving don’t you think? So here’s a little hint, everyone, I DON’T CARE! 🙂 You have to click on this picture. 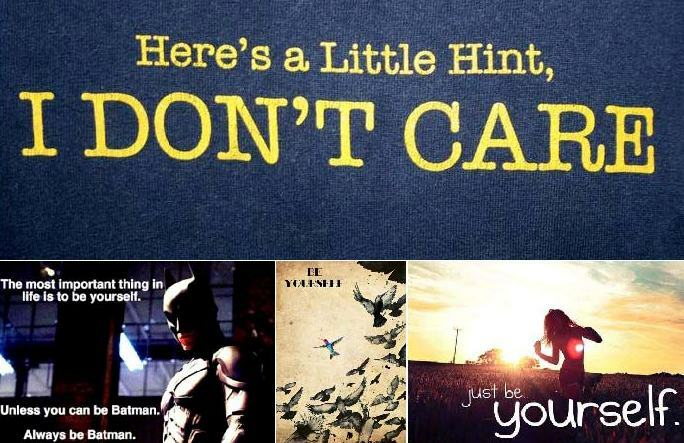 I compiled it and the Batman one is my FAVE! Love me some Batman!